Many homeowners want to truly live an eco friendly lifestyle and this includes their home. Environmental awareness has made huge leaps and bounds in recent years. More and more people are becoming conscious of how their actions and lives effect the environment. These green trends have made their way into construction and home design. Eco friendly home designs feature several different characteristics, from the building materials to the interior design. If you want to design and build and environmentally friendly home, it starts with the materials you use. Sustainable building materials have become increasingly popular in both commercial and residential construction. This gives your home a great foundation that won’t undo all of the eco friendly designs you decide to utilize in your home. Any house needs to have stable walls that will hold up to different weather conditions. While you want a home that is eco friendly, you also want one that will stand up to the test of time and provide long term shelter from the outdoor elements. Your wall materials are important because they have multiple benefits in a green home. They not only create the structure, but also have insulation and sustainability considerations as well. Cob houses are a common tiny home option because of their self-sustainability. Cob is an all-natural material that’s made from a mixture of clay, sand, and straw. This mixture of materials gives you a construction material that binds together all of the loose debris and hardens to form a durable structure. While you may think the combination of these materials would breakdown over time, there are cob structures that have been standing for over 500 years. It has the aesthetic of a quaint fairytale cottage complete with a thatched overhang roof. This roof design is the key to a lasting cob structure. It protects the walls from any excess moisture that may compromise the structural integrity of your home. A raised stone foundation keeps standing water away from the base of your cob walls. This eco friendly home material is nonflammable and insect resistant. This is another eco friendly home material that sounds like it was pulled straight out of a fairytale. Straw bales can usually be found locally, cutting down costs and construction time. Don’t worry, your walls aren’t going to be just stacks of straw bales that could blow over any minute. The foundation of straw bale homes are usually stone for the same reasons as the cob construction method. You want to keep as much excess moisture away from the straw bales as possible to ensure their stability. After you’ve laid your foundation, there are two different types of straw bale construction. The first is the load bearing technique. This is what you’d typically think of when you hear straw bale construction. The straw bales themselves are the actual structure and are plastered afterwards to for stability. The second type of straw bale construction is the non-loadbearing technique. This means that your home is made from a lumber frame and the straw bales are used as insulation or infill between your boards. You can use a combination of the two to use the appropriately named hybrid technique. 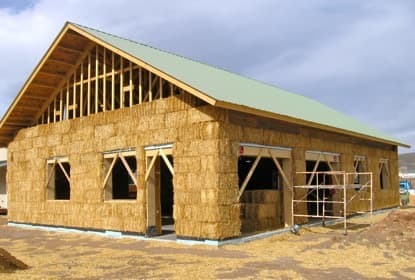 No matter which straw bale construction technique you decide to use, the same pros and cons are there. There are a few benefits that may be surprising to those who aren’t familiar with straw bale construction. Straw bales are actually less flammable than homes with a wooden frame. The bales that are used for construction are tightly bound leaving almost no oxygen in the material itself. It also has much less moisture than bales that are typically found in barn fires. This means that there is less breakdown of the material before the fire even starts. The thick bales also make a great insulator in environmentally friendly homes. These thick bales can also be a drawback. Because of their thickness, you need to factor in the loss of some square footage in the interior of your house. You can design accordingly and the lower construction cost makes it a little easier to make your home bigger. Obviously with any natural grass or plant product, it will hold more moisture and be more susceptible to insects than other housing materials. This can lead to more problems later on, like infestations and mold. While measurers can be taken in the building process to add stability to your straw bales, they will still be less stable than other materials out there. It’s the nature of the product. Underground homes could be the most eco friendly home design out there. Also called earth sheltered homes, these structures are built completely underground other than your door and a few windows. Many times the homes are made from mostly concrete, protecting you from any weather conditions that would otherwise be a danger, such as tornados. There are three types of underground construction. The first and most common are in-hill construction homes. These are the homes that are built into an existing hillside or slope. There is one exposed wall that holds the front door and a few windows. The rest of the house is embedded in the hill. The second underground home design is built from a technique called earth berming. This consists of creating a man-made slop around your home back piling soil around the sides of your house to create a slope. The building is completely above ground and because the hill is man-made, you have the ability to leave gaps open for windows to allow more natural light into the home. The last and most construction intensive underground home design is a fully recessed home. This home is completely underground and is built by digging out the space for your home and is later added back on top of the structure, leaving a space for the front door and that’s all. There are some obvious benefits to an underground home design, such as no exterior maintenance. The Earth growing to overtake any exterior part of your home besides your front door is actually what gives your green home design the eco friendly benefits! By keeping your home underground, you are conserving energy and taking advantage of the Earth’s natural thermal efficiency. It goes without saying that an underground home design, whether it has a concrete frame or not, isn’t recommended for areas that are prone to flooding. They also require a complex ventilation systems. There are plenty of contractors that can help you find the best ventilation solution for your underground home. Last but definitely not least, it can be difficult to acquire permits for an underground home because of their unusual nature. Contact your local housing authorities and municipalities to find out what’s permitted in your area. Rammed earth construction has been used as a resourceful and environmentally friendly way to build structures since ancient times. The technique consists of layering moist dirt and compressing each layer to create a compact and dense framework for your house. Rammed earth structures can be found on every continent except Antarctica. They can stand up to many different climates, both dry and wet. Builders usually use a mixture of sand, gravel, and clay to create the durable material that hardens to create the home structure. Rammed earth construction has a low building cost if machines are used to compact the dirt. If there aren’t machines available, the process can become very labor intensive and therefore, more expensive. However, this eco friendly home design has some of the most environmental benefits of any of the materials listed in this blog post. Rammed earth has the benefits of using mostly readily available materials no matter where you’re planning to build. Once the home is built, rammed earth walls have a high thermal mass. This means that it can absorb heat during the day and release it at night to regulate the temperature in your home without too much need for a heating and air conditioning system in your home. These structures are also fireproof given their materials. Rammed earth buildings are also sustainable as the frame work can easily be knocked down and reused again. There are only a few drawbacks to this otherwise great choice for your eco friendly home design. Because of the construction process, your home must maintain a boxy shape and won’t be able to accommodate any curved walls you want to feature in your home design. If you plan to build your environmentally friendly home in a colder climate, expect to need extra insulation for your home. If you live in a typically wet climate that gets heavy rainfall, you will need to install vapor barriers in your home. After you’ve decided on the walls that will create the frame, you’ll want a roof that will stand up to rain and any other harsh weather conditions that may come your way. These can simply be sustainable resources or can be multifunctioning in terms of shelter and energy producing. These eco friendly roofing materials come in a variety of styles that can match whatever aesthetic you want for your green home design. Earth sheltered homes come in many different forms. From underground homes to roof top deck gardens, incorporating living vegetation into the roof of your home has been a growing trend in eco friendly home design. Some people use to improve the environment and to make up for the vegetation that no long grows where their home’s foundation is and others us the space as a vegetable garden to start the process of self-sustaining living. They collect any rain runoff that would otherwise be standing water on your roof and could possibly damage your eco friendly home materials. This also helps to protect your roof from any heavy weather that could cause damage to regular roof tiles. There are three types of earth sheltered homes that are commonly used for green home designs. 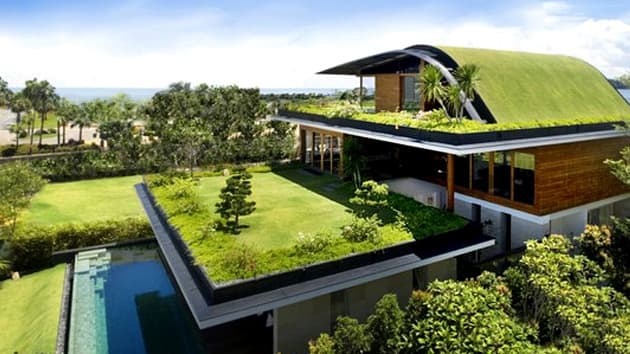 The first and most involved earth sheltered home is an intensive green roof. This is what you would find on homes that are completely underground or built into the hill. This is the thickest option and it can support a large variety of vegetation from trees to simple grass. The second green roof option is the extensive design. These types of roofs are common on commercial buildings and are lighter and thinner than the previously mentioned intensive. It supports a smaller variety of plants that includes grass, flowers, and small bushes. 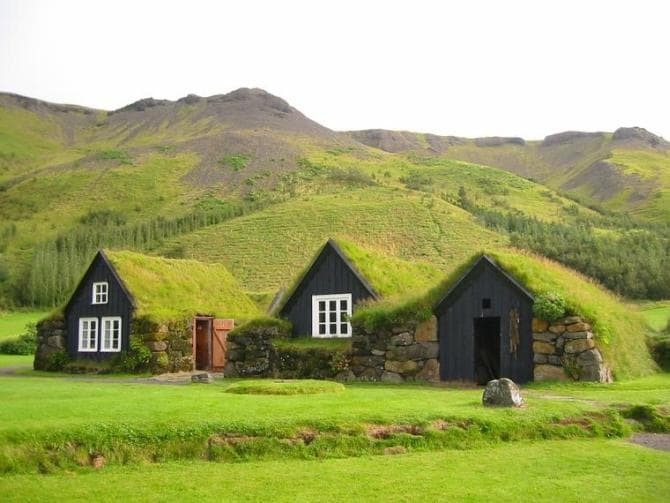 The last type of a green roof that people typically have are the tray style of green roof. These non-permanent fixtures are the least expensive of the three options and consist of containers or trays that act as planters. These are great for people who want to add another layer of sustainability to a pre-existing home without doing a complete home renovation. Because they’re in trays, you can move them around your deck or roof to create new spaces and new design styles. These panels are a hybrid product that are meant to provide you with alternative energy, as well as have a basic function of roof tiles. Solar shingles capture sunlight and transform it into electricity to power your home. The two designs for this roofing style are solar panels and solar shingles. Solar panels are the long panels that people are used to seeing associated with solar panel roofing. However, many homeowners want the alternative energy, but they also like the look of a traditional roof. This need created the second design of solar shingles. These smaller panels are more flexible and are shaped similarly to regular roofing tiles. This is another roofing option that can be retrofit to an existing home that you want to incorporate more eco friendly home designs. Inside your home, you want floors that are eco friendly but also comfortable to walk on. Using environmentally friendly materials doesn’t mean that you have to walk on dirt floors for the rest of your life. Use flooring materials that are easily found and in excess. Here are a few flooring options that are made from common materials. Bamboo flooring is a popular option for both budget renovations and a new green home design. This particular wood flooring option has a ton of benefits that make it the ideal flooring option for eco friendly home designs. Bamboo flooring is a low maintenance and water resistant material that comes in to different colors, caramel and a sandy blonde. Caramel is a richer wood tone and gives you the classic look that you would normally find with hardwood floors. The sandy blonde tone is a lighter wood that brightens your space and gives the space a more modern look. This durable material is perfect for high traffic areas, such as kitchens and living rooms. However, it is susceptible to warping depending on the humidity conditions. It can either stretch and bend with heavy moisture or shrink in particularly dry areas. This somewhat unconventional material is becoming more popular in environmentally friendly homes. Cork flooring is extremely durable which makes it great for family room and living rooms where you will see the most amount of traffic. Not only is it rot resistant, but it’s also a natural insulator. This keeps the need for a heating and cooling system to a minimum. If you can cut down the need for extra utilities by using the right materials in the home structure itself, you are one step closer to creating a completely eco friendly home design. The only major drawback to cork flooring is that it can’t stand up to standing water. This really isn’t that big of a deal, as long as you avoid installing cork flooring in your bathrooms. Natural fiber carpeting is appealing for the obvious reasons of it being a traditional flooring option. While many people want to build an environmentally friendly home, they don’t want to give up any comforts that they have in their current home. Natural fiber carpets come in a few different materials. The first and most commonly used natural fiber carpeting is a woven wool fabric. Wool is a natural insulator and is a natural stain repellant. It can repel small amounts of water, but should never be left in standing water. This is a fast way to have mildew grow in your new eco friendly flooring. Seagrass carpeting is a natural fiber flooring option that is made from woven plant fibers and is extremely durable. However, like wool carpeting, you should avoid excess moisture in areas where you have seagrass carpeting installed. As is the case with most carpets, natural fiber and synthetic, it will lead to the growth of mold and mildew. The most unconventional natural fiber carpet option is coir carpet and it is made from woven coconut husks. It fits well into cottages or rustic log cabin aesthetics. It’s not the softest to walk on and should probably be kept to hallways and living rooms where people will most likely have their shoes on. Jute carpeting is a soft flooring option that is made from plat fibers that are woven to create your carpet. However, because of its softness, it’s more likely to rip than the other flooring options and should be kept to low traffic areas, such as bedrooms. The last natural carpet option is one of the most expensive. 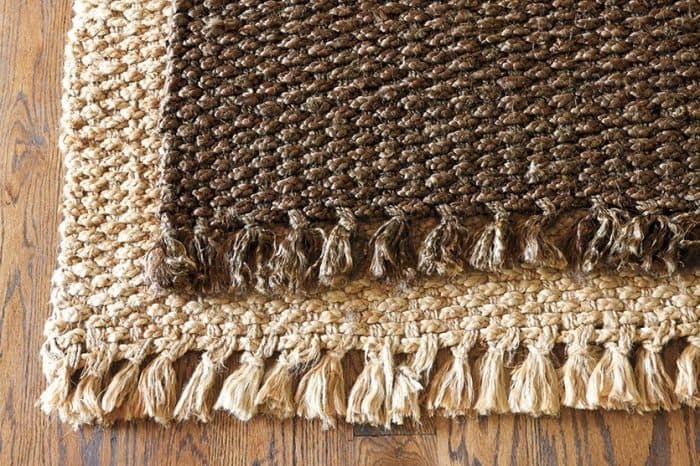 Sisal carpet is soft, but durable and can easily be dyed to match your home décor. However, because it is easily dyed, it is also easily stained. You will have to take precautions and pretreat your carpet to stand up to dirt and stains. Your eco-friendly design choices don’t have to stop at the construction materials. By incorporating different features in your home, you can create energy and heat. These structural features also keep your construction costs low. Eco friendly design isn’t just about giving back to the environment, but also keeping your intrusion of it small. When you’re building an environmentally friendly home design, you want to keep an open concept at the fore front of your home design. The first part of this is to keep your floor plan open. This allows the free flow of air and light throughout the house. Within this open floor plan, pay attention to the placement of your individual rooms. If you prefer your bedroom to be cooler, place it near a tree that could provide shade from any heat that would come through with the sun. If you want your living room to be a cozy room that is warmer than the rest of your floor plan, place large windows in the room for maximum light and heat to come in from the sun. Your home design should also incorporate as many large windows as possible. They allow in a lot of natural light during the day that makes your space feel larger and brighter. Large windows also let in a lot of natural heat during the day. If you choose the right home materials otherwise, you can almost entirely eliminate the need for an extra heating and cooling system in your home. When you’re looking to build an environmentally friendly home, you want to keep your home’s impact on its surroundings as minimal as possible. One way to do this is to build vertically and keep the horizontal footprint small. By building the house on top of itself, you are able to keep as much land around the house as undisturbed as possible. One way that many homes create square footage is to utilize lofts in their home. There are several different loft designs, the most common being bedroom lofts. If you decide to keep your loft as a frequently used space, you will need a stable and secure means of access. If you want to keep your open floor plan and maximize the space in your environmentally friendly home, a traditional staircase probably isn’t the right option for you. They take up a lot of room and interrupt any light flow you had going through your home. Ladders have a small footprint and are completely open, but they are of often unstable. Spiral stairs are the perfect solution in the middle of these two options. A Classic Steel Spiral Stair is a loft stair option that will last as long as your home. If you want a traditional look, you can add solid wood treads and handrail. If you want a custom color that will blend into your home design, your spiral stair can be powder coated a custom color to match your walls and not take away from any other design features you may have. Whether you want to have a completely environmentally friendly home design from the outside down to the furnishings or you want to add a little more green to your home, there are plenty of interior design solutions. The first and most obvious eco friendly interior design accent are houseplants. Not only do they liven up your space by adding some green, but they also improve your air quality inside the home. 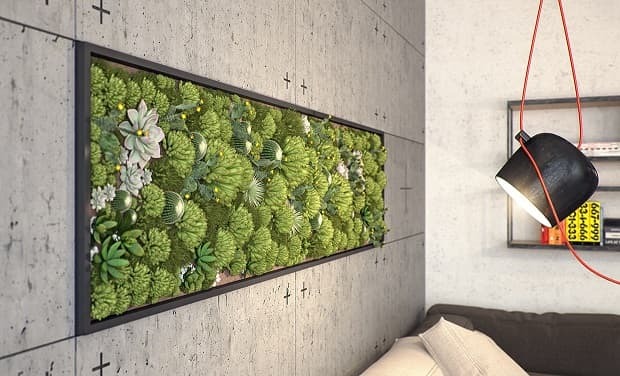 You can elevate this interior design idea by installing a living wall in your home! If you want to add even more color to your home, consider eco paints. Eco paints give you the same custom color that you would find with a regular paint, but without the toxins that you find in them. Regular paints are made with volatile organic compounds that release toxins in the air as they dry. These can not only harm the air quality and environment, but you as well. Eco paints have low to zero VOCs in their formulas. There are plenty of accent pieces that can add to your home as well. Repurposed products are a great way to recycle items and cut down on production costs. Reclaimed wood is a major trend in interior design recently. By using recycled pieces, you are keeping new materials from being harvested and therefore, stopping more pollution from entering the environment. You can also choose to shop and buy sustainable products. These are made with the purpose of having the smallest footprint both in materials and production pollution possible. Eco friendly utilities are the most common way that people incorporate environmental awareness into their home. It can help cut the cost of running your home, as well as reducing your carbon footprint. You can incorporate them directly into your home design or use them in your existing home. There are two major different ways to incorporate an eco friendly heating and cooling solutions in to your home. The first is by installing a programmable thermostat. A programmable thermostat allows you to set when you want your home to heated or cooled depending upon the time of day. You can save money and energy by choosing to use either of these functions during times when the natural warmth of the sunlight isn’t cutting it. The second and more involved heating and cooling solution is to incorporate geothermal energy into your home. Geothermal energy gets its energy from steam or hot water reservoirs underground. The heat from the water drives an electric generator. This is ideal for an eco friendly house that wants to minimize its carbon footprint. Sustainable and eco friendly water solutions are one of the most popular additions to any house. Not only does it keep your bills low, but it’s also an easy way to help the environment. One of the best ways to utilize your home’s surroundings is to install a rainwater harvesting tank. While you can’t use the water for drinking purposes, you can use it for a number things such as laundry and washing your car. It can also help sustain your surroundings by reducing the risk of floods and soil erosion. If you don’t want to install a new water system in your home, you can implement water conserving practices in your everyday life to reduce your footprint on our planet’s resources. Ensuring that there are no leaks in any of your pipes or faucets is one of the best ways to reduce unnecessary water usage. There’s always the common practices of turning off your faucet after you’ve wet your toothbrush and only running the dishwasher or washing machine with full loads. These may not seem like they do a lot, but every little bit can make a difference. Not only is your electricity bill probably one of your highest, but it’s also the easiest to manage. As one of the first utilities that was revamped for newer and more sustainable options, there are plenty of eco friendly electricity options for any home. You can start conserving energy with something as simple as changing your lightbulbs. Consider replacing your regular lightbulbs with compact fluorescent lightbulbs. CFLs give off the same amount of light as your standard lightbulb, but only use between 20-30% of the energy that a standard lightbulb uses. They’ve been proven to last up to nine years while being used about 3 hours a day. Solar panels have been increasingly popular in residential home design recently. While they can be expensive to install, they will drastically cut your electricity bill. This is also a great option for homes in areas that cannot access regular electricity easily. Eco friendly designs have been growing in popularity in every industry. Home design and building has been one of the areas most affected by homeowners wanting to minimize their carbon footprint. Whether it's building materials or design features, everyone is going green in their home design. We've provided some of the most common ways to create a more eco friendly home and how to incorporate them into your new home design!